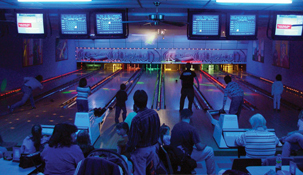 COSMIC Bowling is glow-in-the-dark bowling with a dance club atmosphere that rocks the center with a state-of-the-art sound system. We play great tunes, add to that strobe lights, disco lights, rope lights and a fog machine that fills the center with fog, it really is the place to be to rock'n'roll. For an out of this world bowling experience try our Super Cosmic Bowling awash in black-lighting with disco balls all ablaze and a state of the art sound system designed to really rock the house! Super Cosmic Bowling provides a whole new twist to your bowling experience and is available every Friday Evening, 9:00 PM - 11:00 PM. 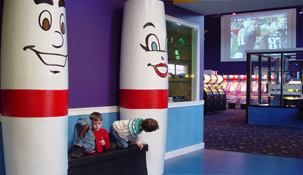 If you like to have FUN and listen to GREAT MUSIC while you bowl, try our SUPER COSMIC BOWLING! We take reservations for 9:00 PM Fridays.